There are two companies that feed into the coal zone but one of them has gone bankrupt but has no exposed dead ends. Could an active company force (build) a three-pronged track into the bankrupt companies track to take over? Just found the game so I have no access to the rules (except watching the rule video posted here). 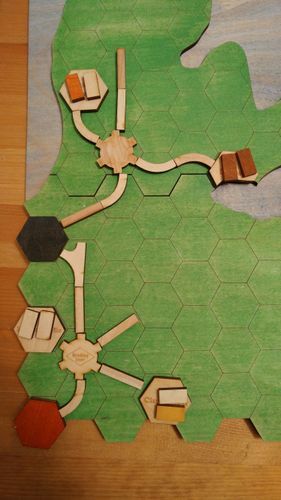 The rules video stated that to merge you have to connect to an open end of the bankrupt railroad by placing a tile from one of your own open ends. Upgrading a tile is a move made by the railroad that owns the tile, so you can't do that from another railroad. So in this case you need to first build a bridge, then a turn into the central spine of the bankrupt railroad. In the oldest edition you could not, however, about 2 years ago, that was changed to permit splitting the other company's track to create the merge. So the answer is, YES, if you have at least one build to spend, you can connect to that company by splitting it's track.